Are you missing teeth? Is your smile less than stellar at the moment? Stop hiding your smile from the world and give us a visit. Blanco Circle Dental Care offers dental implants to help restore and improve your smile. Dental implants are a great choice to replace missing teeth because they’re the restorative dentistry option that functions the most like natural teeth. Also, you won’t need to worry about slippage or other issues associated with dentures. A titanium post will be implanted into your jaw bone, where it will bond over time. 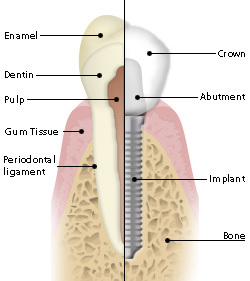 This creates a firm base for your dental implant, mimicking the function a tooth root serves for your natural teeth. A porcelain crown will be custom made to resemble your natural teeth and attached to the post, completing your restoration. We also offer mini dental implants that can help to anchor dentures. No matter what your smile needs, we have a solution that can help replace your missing teeth. It is important to replace missing teeth to help maintain the health of your smile. Dental implants can be a great option to replace missing teeth and fill in those missing spots in your smile. Give us a call to see if this is the right choice for you.